Your surfing always progresses faster when you’re on holiday. These surf coaching holidays have been organised so that you can take advantage of some of the amazing surf spots that lie off the beaten track, away from the well known spots that are densely crowded these days. Each location has been chosen for it’s super reliable conditions and surf spots that are perfect for your level. Enjoy a higher quality of waves than you’re used to, warm waters and just the right amount of challenge. The aim is to experience new aspects of surfing, have a travel adventure with good people and go home stoked. Who are these Surf Coaching Holidays for? Each trip is organised by surfing level so that I can choose locations with waves that will fast track your progress. You can check your level here. Level 2 Surfers – A trip for you will involve mellow forgiving waves that make it easier for you to enjoy a high wave count and long yet slow peeling waves so you can work on your turns. Level 3 Surfers – We’ll aim to ride a variety of waves and develop some new skills. Spots that offer steeper walls and speed but aren’t too powerful and intimidating. Level 4 Surfers – We’ll seek out slightly more challenging spots that offer entry-level barrel riding, as well as long, quality spots to let you link moves and get plenty of practice. Guiding and lots of surf time. The surf locations will be fully researched before the trip begins and all logistics arranged. You just need to show up with your favourite surfboard or boards and be ready to surf at your best. A supportive and positive environment. Many surfers on the World Tour have a coach that films them for feedback, talks through ideas and problems, and generally helps the surfer get in their peak performance zone. You can expect this kind of support on any surf coaching holiday and a focus on achieving your goals. 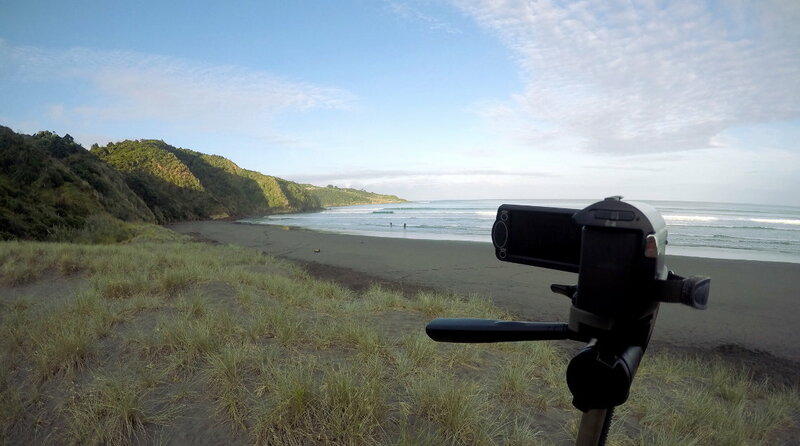 We’ll aim for 2 filmed surf sessions per day plus analysis and feedback post-surf. Repetition and a tight feedback loop is key for progress. You can make adjustments so quickly. We can talk through techniques and get clear on tweaking things as needed. If the waves are challenging and fear is an issue, you’ll be encouraged to push limits but with a safety net and full understanding of what you need to do. Video footage and photos of you charging! In addition to the video footage for helping you improve, we’ll also aim to get some quality images of you surfing sick waves that you can take home. This includes in-water photography for those classic angles. Overseas trips may have a professional photographer arranged too. An intrepid travel experience. We’ll be surfing a lot but there will still be the chance to check out anything of interest in each destination. We’ll hunt down the best places to eat, visit scenic locations such as waterfalls, swimming spots, hot pools, and generally explore our surroundings. Every surf will be filmed for a tight feedback loop and maximum progression. All the surf coaching holidays include accommodation. Transport during the camp is also included and I will provide details on how to get to the camp’s destination or starting point. All meals are generally included as well as other inclusions and experiences. To see the full inclusions and cost for each camp, choose a location below. Overseas surf coaching holidays will typically be 7 to 10 days duration.